Test Systems : Test Systems for Civil Engineering and Construction | Saginomiya Seisakusho, Inc. 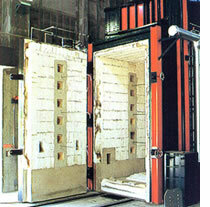 This furnace can test high yield strength pillar members by loading and heating them. The internal distribution of members, thermal properties, deformation, rupture, and other dynamic data in the occurrence of a fire can be obtained.